Gosh – it’s been such a long time since I blogged (my August Indulgence, in fact), never mind contributed something to Cathy’s nice meme at Rambling in the Garden. Fully determined, I was, this morning, to pick some of the last roses flowering in the garden. But the endless rain did for them yesterday and instead of coming back with a large bunch of ‘Louise Odier’, ‘Mme Isaac Pereire’ and ‘Mme Alfrede Carriere’ (the first two being Bourbons, the last a climbing noisette, I think), I tried to focus on my snapdragons instead. There are only two this year and, actually, they also are not too hot at the moment either! I grew ‘Black Prince’ (with nice dark foliage, but stems that are really too short for cut flowers) and ‘Rocket White’ (much more pleasing, with lots of long-stemmed flowers over a long period). I think I had a mind’s-eye picture of a small vase of the red antirrhinum with maybe some small Ammi majus flowers as well. But as happens only too often, it didn’t quite turn out that way. Still, I like the autumnal feel of the vase. 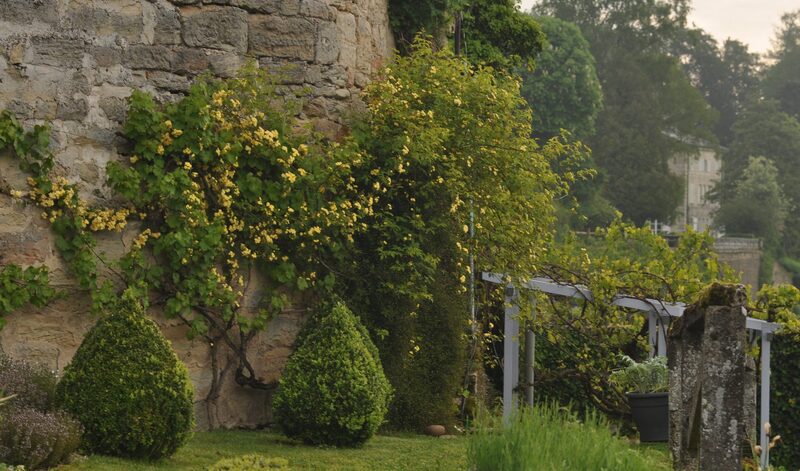 There are two roses – climbing ‘Wollerton Old Hall’. This is one of the most luscious roses it’s ever been my privilege to give a home to, but you can see it’s suffered from our heavy rains this year. More than its fair share of black spot – when will I learn to do the last minute primping properly! And then there’s a bud of ‘Sweet Juliet’, which I’ve found makes a really good cut flower, along with ‘Queen of Sweden’. However – and I will probably be accused of being a bit retro here – the truth is I’ve never regretted buying three Hybrid Teas in 2017. They make much more classic cut flowers than the old roses or David Austin’s group. Long stems and plenty of perfectly shaped buds. The best has been white ‘Pascali’, followed closely by sweetly scented dark red, ‘Mr Lincoln’. Pity I never shared them with you, but I’ll be adding some more colours next year and I’ll try and do Monday vases with them. Can you suggest other good cut flower HTs? Pink is not usually ‘my’ colour in dahlias – I prefer the dark purples, which I keep losing over winter – but this flower has a sort of grace and delicacy that I’ve enjoyed greatly this year. Then I added some Zinnia ‘Benary’s Giant Lime’ and the greyish-blue foliage of Thalictrum flavum subsp. speciossisum, which was cut back in July and is now good and fresh again. I seem to use it endlessly – hopefully I’m not boring you?! Finally three flower spikes of Pennisetum alopecuroides. I’m still struggling to find a good position for this grass which was, as they say in the States, a ‘pass-along’. It keeps being dumped down behind other plants and never gets to show itself off much as it deserves. Isn’t it funny how you spend a fortune on some plants that don’t thrive, and then others – lovely gifts – are neglected, but still persist. There’s a bit of transferable gardening philosophy there. Lovely to be sharing with the Monday vasers again. Life has just been so darn difficult recently … time for another new leaf, I think! This entry was posted in A vase on Monday and tagged Antirrhinum 'Black Prince', Antirrhinum 'Rocket White', Climbing rose 'Wollerton Old Hall', Pennisetum alopecuroides, Rose 'Sweet Juliet', Thalictrum flavum subsp. glaucum, Zinnia 'Benary's Giant Lime' on October 30, 2017 by Cathy. Unfortunately the gardener still hasn’t been to cut the grass (she seems to think that planting sweet peas, perennials and thinning spinach is more important), so the border is still looking a bit scruffy round the ears this week. Rosa ‘Canary Bird’ is going over now. Behind the rose is one of the few cool areas in my garden, where there are some hostas lurking in the shade of the hazels that were here when I started to garden (lovely with snowdrops, great for plant supports!). They were just fine until we had our recent heavy frosts – even the hostas and early buds on some of the roses were damaged. Pleased to report that now all are in the recovery position. A little frost damage – but recovering now. That is, until the snails come along! Asphodeline lutea has it’s finest hour now. I love the spikey foliage and the emerging flowers, but later in the season the foliage goes brown in the heat. The foliage of the asphodeline has a very chic, swirly way with it, don’t you think? Then, it rather joyfully produces some more of those fresh, spikey leaves with the autumn rains. I’m thinking it might be nice to introduce some blue camassias as well. Thalictrum flavum subsp glaucum is a big plant, but also starts to look terrific right about now and produces a little cloud of yellow flowers a bit later. I’m fond of it because it copes so well with the heat and the clay up here, unlike the majority of choicer thalictrums. I can also cut it back when it is looking messy/tired and I get a little carpet of bluey-grey foliage regrowing. This year I’m trying one called ‘Elin’, which is a cross between this tough species and the more elite (and difficult to please) T. rochebrunianum. ‘Elin’ takes purple flowers and darker coloured stems from the classy parent. I’ll tell you how I get on – it’s looking a bit miffed at the moment! You’ll have seen by now that I’m a big fan of giant plants and Angelica archangelica is something I tried repeatedly to grow from seed unsuccessfully. I’ve managed Angelica officinalis easily! It looks more or less the same – especially in flower, the most important thing – and I really can’t see much of a difference, except that it is not as big. It has started sowing itself over the border, thank goodness, so I don’t have to worry about germinating it again. It gives kind of a lush jungly look at this time of year, especially when the flowers of the philadelphus and deutzia come on. These plants won’t flower until next year now. Or will they surprise me? I’m going to have to take two weeks off my ‘Tuesday View’ because I’m going away. I hope the border doesn’t rush on too fast for me! With many thanks to Cathy at ‘Words & Herbs’ for hosting this meme! Do take a look at how everyone else’s border is developing this week. It’s the most exciting time of year! But, before going, I couldn’t resist adding a couple of pics of my Rosa banksiae ‘Lutea’, now a little past it’s best. This is a romper! Only planted in 2013, it makes our house look rather like a stately home. It most definitely is NOT! We live in the old Renaissance watchkeeper’s house in the village, and the tower that you can see here has been incorporated into our house, but was originally part of the medieval village ramparts. Have a good week in your gardens! This entry was posted in Tuesday View and tagged Angelica, Asphodline lutea, Calamagrostis 'England', Deschampsia cespitosa, Philadelphus, Rosa 'Canary Bird', Thalictrum flavum subsp. glaucum, Weigela on May 10, 2017 by Cathy. Cathy’s meme at Words & Herbs is such a good idea (you show the same view of your garden as it changes through the seasons), but I’ve always hesitated to join in with it because I felt my pictures would be too boring! Now I’ve found a reason. I’m not very happy with what I call the ‘Long Border’ in my garden. It’s ok, but it fails to please me later in the summer when all is baked hot and dreary with the 30 degree C temperatures we usually get at some stage or another. Earlier there were some rather nice tulips and Narcissus ‘Actaea’. Now the border’s moving on to the next stage with philadelphus due to flower along the bank. Until 2013 it was just a slope of rough grass with three hazelnut bushes. I added cuttings of philadelphus and deutzia that I made in the town where we used to live. Then I started growing plants from the Hardy Plant Society seed list every year. Looking up the border from the other direction, it’s clearer that there are also iris and hemerocallis living here. I was less successful than I used to be in the past, but I still had plenty of Thalictrum flavum ssp glaucum and Asphodeline lutea to plant out. I’ve added yellow and white irises and there are quite a few tulips. Artemesia ‘Lambrook Silver’ (from cuttings), Asphodeline lutea (from seed) and Thalictrum flavum ssp. glaucum (from seed) were repeated a little along the border for good foliage effect – now some of the excess thalictrum is due for removal down below to allow space. Now I want to create a much hotter border for later in the summer – because of the clay soil and the heat, I am trying to bump up the grass and helenium population. Both seem to do well, even with little watering. Grey plants (which I love) don’t do very well here and I make the most of those that are thriving. Currently a rather nice little ‘Canary Bird’ rose is finally getting away below the purple berberis, embellished with a little Euphorbia griffithii ‘Fern Cottage’ at its feet. The rose has died back a little each year since planting – this seems to be what always happens on this clay soil – but finally this year it is getting its toes in. Last year the Long Border still didn’t look right. I’m hoping that in joining in with Cathy’s meme I can work out how to really change it so that I’ll enjoy it in the summer months too. Anyway – here I am now, Cathy, with my boring border pictures! The photos were taken on the last day of April – I took them originally to link in with Helen, at The Patient Gardener‘s End of Month View. So there are a few more pics of two other areas in the top (nearly completed – continually evolving!) part of the garden. In addition to the Long Border, I’ve taken a few of the Rose Walk (no roses yet!). I lost my four large bronze fennels in the winter … a pity, because they were so lovely when the alliums came along. Now replanted with the seedlings they threw all over the shop. The box balls have been rather badly damaged by our late frosts. I’ve kept them shaggy so far as a measure against box blight while they grew, but they are now just about the right size to keep a bit tidier (out of the typical box blight weather). The roses have an edging of chives and an underplanting of Stachys lanata, Nepeta ‘Six Hills Giant’, dianthus and Achillea ‘Lilac Beauty’ – which still isn’t quite working, but I’m getting there. From the other end, there’s a good view of my new greenhouse (still under construction – green umbrella marks the labourer’s shelter). There were not as many tulips this year because 2016 saw a lot of tulip fire in this part of the garden, so nothing was added. But these ‘Sorbet’ tulips were still rather jolly. …. and my tiny little mini-woodland. This last is going to sleep now. I used to adore woodland plants in the past, and this little shaded area at the end of the Long Border is the only place I have (so far) to grow my favourite plants. Do go and look at Cathy’s Tuesday View and enjoy what other bloggers are showing us. Similarly, the great pictures of Helen’s front garden in her End of Month View. She’s renovated it in the last couple of years and I’m in awe! This entry was posted in End of month meme, Garden development, Mini woodland, The Long Border, The Rose Walk, Tuesday View, Tulip fire, Tulips and tagged Asphodline lutea, Chives, Rosa 'Canary Bird', Thalictrum flavum subsp. glaucum on May 2, 2017 by Cathy. We had a very heavy frost again last night. So many young shoots destroyed! My Magnolia soulangeana ‘Lennei’, which has just flowered for the first time, is a mass of drooping, sad leaves. As is the little Cercis silaquastrum. I do hope they come back again. I’ve chosen Narcissus poeticus for my vase today. Included is foliage of Thalictrum flavum ssp glaucum (which I persist in calling Thalictrum speciosissimum!) plus some rather jolly spikey shoots of Campanula persicifolia. The narcissus look like they are about to fly away. I hope the campanula and thalictrum anchor them a little! I’ve just read that the scent of the poet’s narcissus is so strong that it can cause headaches and vomiting. Let’s hope not, because they are now sitting on the kitchen table! Someone noticed their scent as soon as I put them outside in the sunshine to photograph this morning. N. poeticus is the type species for the genus Narcissus. It is thought to have originated in the Middle East or the eastern Mediterranean area, but now it is naturalised all over Europe. In Britain (where it was reputedly brought during the Crusades) we know it as ‘Pheasant’s Eye’ narcissus. Possibly taken directly from the French ‘Oeil de Faisan’? It is widely used in the perfumery industry here in France – a staggering 11% of perfumes include it as an ingredient. There are vast natural fields of it in the the Massif Central and the Haut Var region of Provence. Many gardeners in our area of Lorraine advocate planting narcissus around special things if you want to ward off vole visitors (which eat roots and can kill plants almost overnight). So I was bit distressed about a year ago to read that voles are decimating those wild populations of the Massif Central. The photo below is courtesy of the Fauna Flora Fonge website dedicated to the wildlife of the Massif Central. Have the voles changed their tastes? Whatever – we have voles here, but I am slowly increasing the plantings of this lovely, late-flowering narcissus in the garden. So far, so good – and we do have a lot of voles! I had imagined it under my four Prunus ‘Tai-haku’. This year the penny finally dropped: I’m going to have to use the cultivar ‘Actaea’, which flowers a lot earlier. The cherry blossom is a memory by the time the species Narcissus poeticus makes an appearance. I made an interesting discovery this morning: my ‘new-to-me’ iPad takes better pictures (automatically!) than I can with my camera. Of course, I had to work out how to share the pictures with my computer. It took an age. The eventual solution – works niftily – was via Dropbox. Now go on over and see what the others are doing for Cathy’s addictive In a Vase on Monday meme at Rambling in the Garden. I’ve just taken a peek and those tulips are luscious, Cathy! This entry was posted in A vase on Monday, Narcissus, Voles and tagged Blue aquilegia, Campanula persicifolia, Chives, Narcissus poeticus, Thalictrum flavum subsp. glaucum, Thalictrum speciosissimum on April 24, 2017 by Cathy.